Have you heard the word “Chakra” and you aren’t quite sure what they are all about? Did you know your body has a energy system with energy centers? 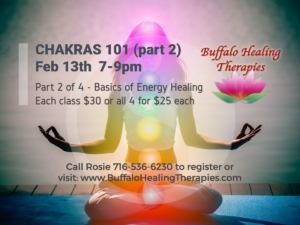 Join Healer, Teacher and Author Roseanne D’Erasmo Script, of Buffalo Healing Therapies for this interactive class that will introduce, or round out your knowledge of our body’s energetic system. In this class you will learn the names, attributes, colors and how to activate your energy points of the last three major chakras in the Human Energy Field: Heart, Throat, Brow and Crown. 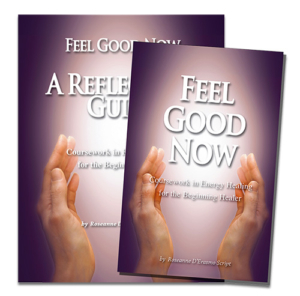 Practice activating and being insightful with Reflection Guide as you engage your chakras at a higher level. Roseanne will share examples of clients who have experienced chakra imbalances in these chakras. Look reflectively at your own chakras. $30 each, or all 4 classes for $25 each.